We can't wait to hear from you! If you have a general question you can call us at 320.846.5443. If you have a specific question contact one of us directly! Hi! We are Tami & Kim Bredeson - two people with a love for wine, family & fun! We purchased the winery in 2008 kicking off one of the greatest adventures of our life! Our goal was to create products and experiences that bring people together for celebration & fun! Along side our family and "CCW" family we are always reaching for this goal in everything we do. Wine should be welcoming, fun, and most importantly, really, really good! Drinking a seriously good wine doesn't mean you can't have fun, and having fun doesn't mean you can't be drinking seriously good wine. That really is the heart of what we do and we hope you stop by and become a part of it. Our son, Tyler, works along side us in managing our large picture operations! He works with suppliers for equipment, bottles, capsules and most anything else we need to source. He also manages logistics and works with our production team to ensure everything is running smooth! Michelle is our daughter-in-law and a big part of our public presence! She plans our marketing mix and creates advertisements & all promotional materials. She is also in charge of all of our design work for our website, wine labels and winery signage! Think of her as the winery "beautifier!" Russ, Russ, Russ...so much to say about Russ and such little space! Russ is our longest standing winemaker and employee! He is the brains and beauty behind all of those DELICIOUS bottles of wine that you all get to drink! He puts his heart and soul into every bottle and it shows. We are constantly in awe of his wine making abilities and couldn't do this with out him. Matt wears many hats here at Carlos Creek including Wine Club Director, HR Manager and MUCH MORE! His favorite hobbies include camping, brewing beer and spending time with his family. Matt is the glue that holds all of our departments together and ensures happiness for employees & customers. We are lucky to have his enthusiasm and care on our team! Our amazing Paige - the planner extrodinaire - the party guru! If you want the best PARTY EVER, Paige is your lady! She has planned over 250 events with us (and counting). Whether you are looking to plan a large wedding or fundraiser or a small gathering for work or play, Paige is your gal. She has planned it all and seen most (there are always new crazy things in the party world). We are so grateful to have her a part of the team! The person behind your fabulous Carlos Creek Winery experience - Mickie makes the magic! Not only does she run the tasting room, but she also purchases all of the unique items for our gift shop. She is the keeper of all things FUN and can help plan your special visit to Carlos Creek! Dan is our road warrior - our wine liaison - our wholesale man! In a nut shell, he makes sure that our tasty wines are not too far from you at any given time! 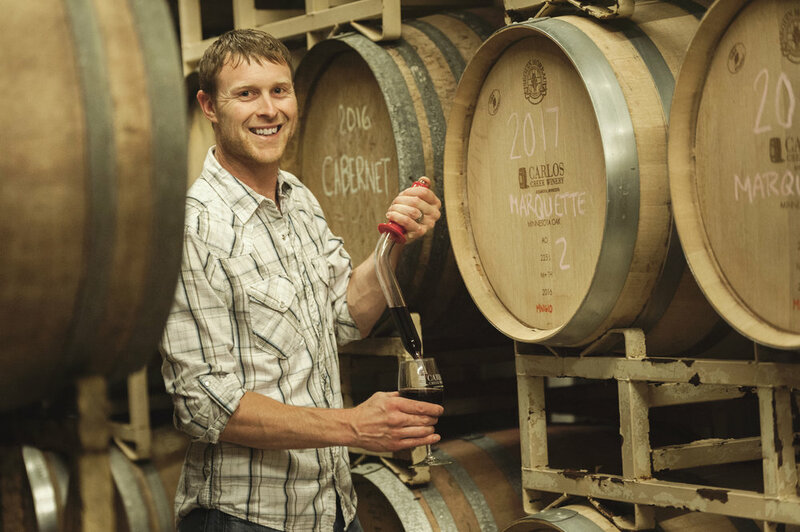 He is the person most likely to be seen at events pouring our wines and making sure that you have fun at the various events around Minnesota! Dan knows his wine and enjoys sharing our story. Say "HI" to Dan next time you see him out and about!